Botox® for the treatment of facial wrinkles is the most common requested non-surgical procedure performed by Rachel Duke, NP at Richmond Aesthetic Surgery. Common causes include smoking, underlying medical problems, sun damage, and genetics. Wrinkles can be divided into two categories based on their underlying cause: static wrinkles versus dynamic wrinkles. Static wrinkles are caused by the effects of age, gravity, and loss of facial bone and volume. These wrinkles are best treated with soft tissue fillers such as JUVÉDERM® to re-volumize, fill in, and lift the areas. 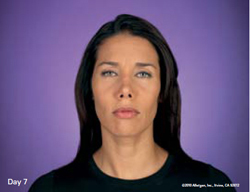 Dynamic facial lines are caused by the repetitive action of the underlying muscles used for expression. Over many years time, the muscles of facial expression will cause the overlying skin to “fracture” or form creases. For example, raising your eyebrows causes horizontal creases across the forehead, which after years of repeating that motion, become etched in lines that are visible even when the forehead muscles are at rest. Other areas include the vertical frown lines between the eyebrows, and the “crow’s feet” around the eyes. Botox® cosmetic is an injectable prescriptive medication administered by Nurse Practitioners and Physicians highly trained in facial anatomy and aesthetics. A fine needle with Botox cosmetic medication is artfully, and strategically placed into facial muscles to treat the signs of facial aging that are caused by dynamic facial wrinkles. When injected properly, the outcome should be a “natural look” that accentuates a persons’ beauty. Placement into the wrong muscles, or by a practitioner that infrequently practices the art of injection placement, or just a few millimeters away then the intended muscle group, can cause unwanted paralysis of facial muscles and therefore poor cosmetic outcomes. Botox®, when injected into the muscle, inhibits the release of the neurotransmitter acetylcholine, which causes muscle contraction. When injected, the treated muscle will be significantly weakened and will no longer contract. This renders the muscle temporarily non- functional and that specific facial expression cannot be made. This temporary muscle paralysis allows for the skin to remodel over time allowing the lines to smooth out and in some cases completely resolve. Results can be seen a week after treatment and last on average 3 to 4 months. Patients with very deep creases of the forehead or frown lines between the eyebrows may also require a dermal filler (Juvederm) and/or skin resurfacing to optimize results. Botox® is most commonly used for wrinkles of the upper face including transverse forehead lines, vertical frown lines between the eyebrows, and crow’s feet around the eyes. There are a number of areas where Botox® is effective in the lower face as well. These include the vertical lip lines around the mouth, prominent cobble stoning of the chin, the bulky depressor muscles along the jaw that lead to jowls and turn the corners of the mouth down. More advanced injectors will also treat the prominent lateral lower jaw muscles such as the masseter muscles and defined platysmal bands of the neck. Some individuals grind their teeth while sleeping and slowly increase the strength and bulkiness of the masseter muscles on the lower lateral face. Injecting this area with Botox® will not only diminish some discomfort related to grinding teeth, but can also narrow the lower face by subsequent shrinking or atrophy of the injected muscles. Individuals with wrinkles present while making facial expressions are great candidates for this treatment. In the past, Botox® was most commonly seen among women over the age of 40. Now, it is very common practice for both men and women to begin treatment starting in their late twenties. Not only does Botox® improve the wrinkles that are already present, but it is also an excellent preventative tool for those younger men and women. In fact, the amount of Botox® injections performed in individuals between 20 and 30 has increased 22% over the last year. Your Botox® treatment begins with a consultation with our Aesthetic Nurse Practitioner Rachel Duke, NP. Ms. Duke will determine your goals with treatment and formulate an individualized treatment plan. Your entire face will be examined looking for telltale signs of facial aging. Your face will be examined at rest and during animation of the facial muscles. Ms. Duke will look for transverse forehead creases, vertical glabella lines, bunny lines of the nose, crow’s feet, down turning of the corners of the mouth, and depressions of the chin area. Depending on the strength of the muscle contraction, thickness of the muscle, and the desired cosmetic outcome of the patient, the amount of units or dose will be assessed and reviewed with the patient. Each patient will require an individualized, prescribed dose of Botox units. Each unit of Botox is $13.00, and the amount of units required varies on the anatomical region treated. The nurse practitioner will determine your dose or number of units during your consultation after examining the involved muscle groups. A common area, such as the glabella area, between the eyebrows, generally requires an average dose of 22 units, with the range being 19 to 30 units for a female. The cost therefore, on average, for 22 units is $286.00. Prior to injections you will be given an ice pack to help numb the skin. Ms. Duke utilizes small 31 gauge insulin needles and syringes, and the most concentrated dilution rate of Botox using 1cc of bacteriostatic saline. With such a small needle size, patients’ experience far less discomfort, bleeding, bruising, and redness then traditionally experienced at other practices with standard needle sizes. Bacteriostatic saline is utilized in order to maintain medication sterility and prevent any “stinging” that often occurs with other types of saline used by other injectors. Only skilled injectors are able to utilize this concentrated dilution rate, and thereby inject minute amounts of Botox solution into the skin to deliver the appropriate dose or units, leaving less of a “bump” or bleb in the skin, and rendering the procedure virtually painless. Several small injections are made into the required muscles, with the entire procedure taking less than 10 minutes. The most common side effects of Botox® are injection related and include slight redness, minute bruising, and tenderness along the injections sites. These side effects, if they occur, typically resolve within 20 minutes but may last up to 3 to 7 days with bruising. Rarely, more severe side effects may occur such as eyelid or eyebrow drooping, flu-like symptoms, hypersensitivity or allergic reaction, and blurred vision. Another very popular procedure requested by our patients is Botox® injections for the treatment of hyperhidrosis, or excessive sweating of the underarms. This procedure takes less than 15 minutes and consists of approximately 15-20 small intra-dermal injections with a very fine needle. Studies have shown that results are seen within days of treatment and last on average 6 months. Many patients have complete resolution of sweating from the underarm area. Most patients require only ice prior to injections for any injection related discomfort. A topical anesthetic is also available upon request. To learn if Botox® Cosmetic can help you achieve your aesthetic goals, please contact us to schedule your consultation. 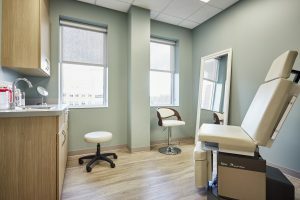 For more information regarding Botox Cosmetic, please visit our Richmond Med Spa sister website Dermlounge.com.